Right inside our front door, we have a little coat closet. It’s not much, but it’s lovely to have, especially after not having a coat closet in our last three homes. Honestly, sometimes I even forget that it exists and wander around the house looking for my coat. When it’s in the closet. 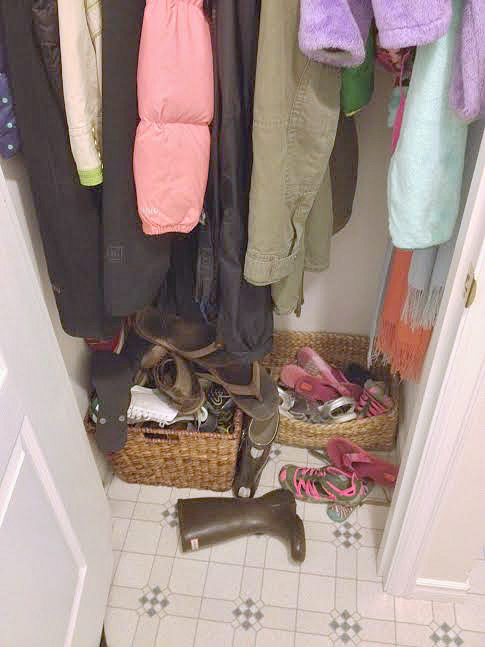 Our entryway is tiny all together and we’re planning on giving it a makeover in late fall/early winter, but we’re starting with the coat closet so that it’s more functional for back-to-school. Because, right now, it looks like this. Please note all of the wasted space on that shelf. Also, that the hanging bar works great for Josh and me to hang our coats…. but not so much for the kids. The bottom is a major disaster and during the school year, it’s even worse, as there are usually a few backpacks hanging out on the floor too. In theory, the little basket is for kids’ shoes and the big basket is for grownup shoes, but we all know how that ends… a big pile of everyone’s shoes. I was originally inspired by this closet that I found on Pinterest and thought it could add more function to the closet. I also loved how this closet had a little bench in it, where the kids could sit down to tie their shoes. Demo out the shelf and bar: This is Josh’s department. Paint the inside of the closet: At first, was thinking big, bold stripes, but now I’m leaning towards a solid punch of color… like coral. I’m also thinking about some wallpaper after I discovered these on Urban Outfitters. Possibly add a bench: Josh thinks it will be in the way. I think it will be handy. We’ll just have to see. Add boards: Painted bright white, for the hooks to be screwed into. Nothing fancy, just some 1×4″ wood in something cheap, but nice. 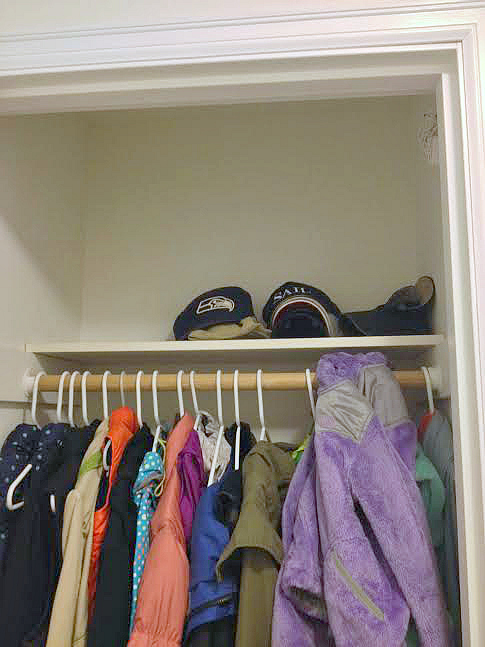 Add hooks: There will be 12 all together, with two on each wall of the closet, one lower row for the kids to access and one higher row for us. I’d love to do a few of these B&W Wall Hooks (Anthropologie, $18 each) on the wall that you see in the back, with some simple hooks for the rest. I saw these Ironwork Wall Hooks on Anthropologie as well, but I’m pretty sure I can get all 12 for the same price ($14 each!) and spray paint them exactly the color I want. Add additional storage: We might add some additional storage on the back of the door with wire baskets, if we can find a way to attach them securely. It would be nice for the kids to have a spot to throw wet hats and mittens. Or for me to stash my clutches. Paint the door, inside and out: Still figuring out what we’re going to paint in the entry, so to be determined. Add a new doorknob and hinges: Oil rubbed bronze? Black? The entire house needs new knobs and hinges, so, again TBD. 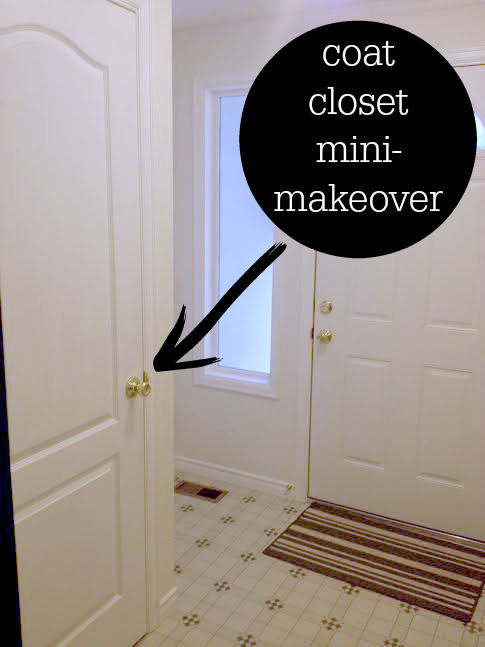 Replace the flooring to continue into the closet from the entryway: Another big decision that we have yet to make. I mean, as much as I love (cough, cough) that blue and white linoleum, I think it’s got to go. This entry was posted in Entryway, The House on Fremont Street and tagged 2014, Entryway, The House on Fremont Street on August 19, 2014 by Katie Kavulla. Even simple hooks on the back of the door for backpacks. But i do like the wire basket idea for gloves!! We did something similar but in the inside of the door we hung one of those pocket shoe holders. I attached it with heavy duty command hooks and it works great! Currently holds gloves, scarves, hats, umbrellas and a few odds and ends like water bottles that they may need for their backpacks. Also great for flip flops when not being worn! Love that, Heidi! As I was searching Pinterest, I noticed that a lot of moms did the same and I like that idea… I feel like I need those on ALL of my doors for the little things that hang out around my house! You’re so brave! A DIY dare? And anonymously? I like you, mystery commenter.